I love everything about this, the fairy image, the stitching, the nestie, simply fab. These little kitties made me smile. 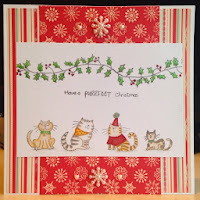 Fab card. your Favourite Christmas Image (& why). I love penguins and this image has been a firm favourite for a long time. He's just adorable and I love that he's quite a small stamp, and very quick to colour. I've cut him out with a huge stitched circle die to give him lots of focus. He's called 'Snow Cute' - and he is exactly that!!! My favourite stamp this year is a Robin stamp from Woodware. There are so many opportunities with it. a little of my doodling. My favourite this year has to be this Snowman, he's handsome, quick to colour, if like me running out of time! And he looks like he's sending best wishes for me lol. My most favourite Christmas stamps are owls and this one is really one of the best. 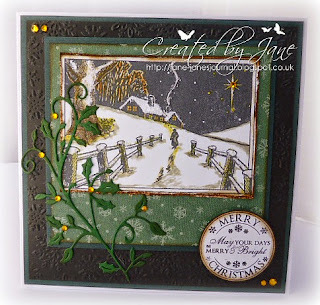 I make this kind of card every year; so quick to colour and what a great effect on CAS cards! My all time favourite Christmas image is any snowman. I have a lot of snowmen stamps and I adore every one of them. Some are cute and some are fun and they are easy to colour. showcase your Favourite Christmas Image (& why). This is our final challenge of 2014 and we'd like to thank you all for playing along with us this year. We'll see you on 1 January with our first challenge of 2015. Merry Christmas from the AYLI girls. Wow, what wonderful samples from the DT...such a pretty and fun variety!!! Gorgeous samples from the team!! 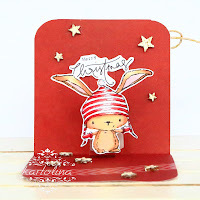 Thanks for this fun challenge and the opportunity to share one of my very favorite stamps! !